NBC 6 meteorologist John Morales has the latest on Hurricane Florence. Hurricane Florence put a corridor of more than 10 million people in the crosshairs Wednesday as the storm closed in on the Carolinas, uncertainty over its projected path spreading worry across a widening swath of the Southeast. The National Weather Service's best guess was that the hurricane would blow ashore Saturday morning along the North Carolina-South Carolina line, then push its rainy way westward with a potential for catastrophic inland flooding. At 11 p.m. ET, Florence was downgraded to a Category 2 hurricane, but officials still warned of a powerful storm carrying dangerous amounts of rain. Duke Energy, the nation's No. 2 power company, said Florence could knock out electricity to three-quarters of its 4 million customers in the Carolinas, and outages could last for week. Workers are being brought in from the Midwest and Florida to help in the storm's aftermath, it said. Boarding up his home in Myrtle Beach, Chris Pennington watched the forecasts and tried to decide when to evacuate. Computer models of exactly what the storm might do varied, adding to the uncertainty. 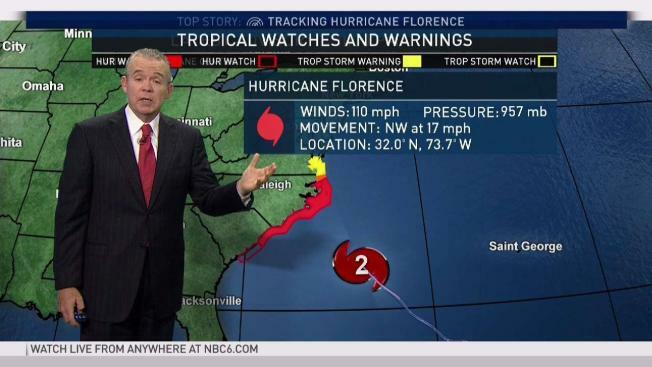 In contrast to the hurricane center's official track, a highly regarded European model had the storm turning southward off the North Carolina coast and coming ashore near the Georgia-South Carolina line. The shift in the projected track spread concern to areas that once thought they were out of range. In South Carolina, close to the Georgia line, Beaufort County emergency chief Neil Baxley told residents they need to prepare again for the worst just in case. Their entire neighborhood evacuated in Wilmington, North Carolina, David and Janelle Garrigus planned to ride out Florence at their daughter's one-bedroom apartment in Charlotte. Unsure of what they would find when they return home, the couple went shopping for a recreational vehicle. North Carolina Gov. Roy Cooper warned in blunt terms of the looming danger, saying that everyone in the state would feel the storm's effects and needed to take it seriously. "My message is clear: Disaster is at the doorstep and is coming in," Cooper said during a morning briefing. Waves 83 feet high were measured near the eye of Florence, according to a tweet from the National Hurricane Center. But that was out in the open ocean, where deeper water means bigger waves. "This is not going to be a glancing blow," Jeff Byard, an administrator with the Federal Emergency Management Agency, warned. "This is going to be a Mike Tyson punch to the Carolina coast." He said that Wednesday was the last day for people under evacuation orders to get out safely. Byard assured people that the agency has all the resources it needs to react to the natural disaster. 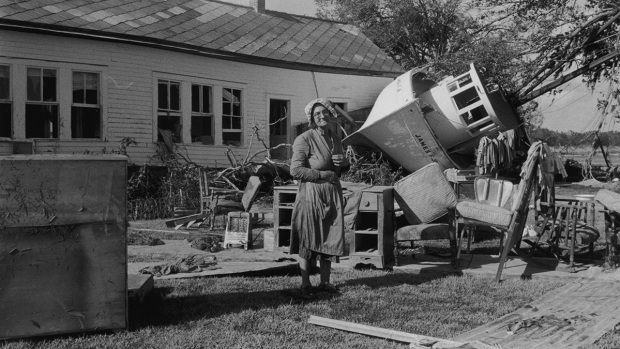 Those who managed to escape are worried about what they left behind and the possibility of floodwaters destroying everything they own. 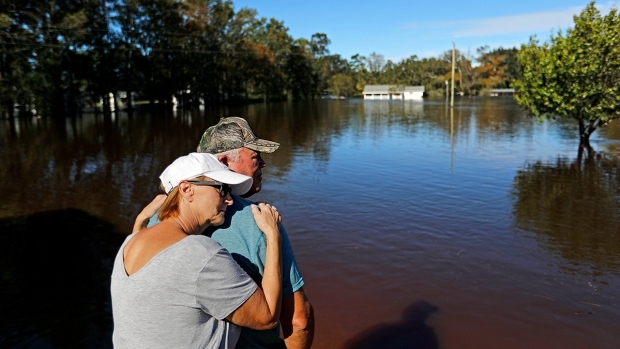 "I'm just scared cause I want a house to come home to," said Wilmington, North Carolina, resident Joseph LaFontaine, whose family evacuated north to stay will family in New York. Florence is the most dangerous of three tropical systems in the Atlantic. Tropical Storm Isaac was expected to pass south of Puerto Rico, Haiti, the Dominican Republic and Cuba, while Hurricane Helene was moving northward away from land. Forecasters also were tracking two other disturbances, including Subtropical Storm Joyce. Florence's projected path includes half a dozen nuclear power plants, pits holding coal-ash and other industrial waste, and numerous hog farms that store manure in huge lagoons. In Wilmington, resident Michael Wilson fortified his home against the wind and rain, and worried.